Uglyworld #193 - We Can Stop Him Drinking Beer, originally uploaded by www.bazpics.com. The other uglies were starting to get a little concerned about Wage's drinking of late and decided to take it upon themselves to sort it out once and for all. 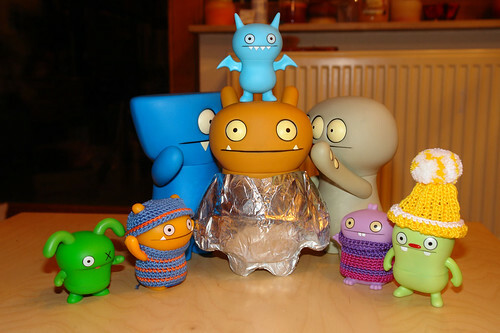 Ice-Bat distracted Wage long enough for Wedgehead and Cinko to get a hold of him and keep him still while Ox, Minimum Wage, Babo and Jeero wrapped him up in tinfoil (enough that he couldn't burst out of it), I think secretly Maximum Wage realises that they're doing it for the best, of course he'll never admit that though!